I remember the first time I played Earthbound. It was unlike anything I had ever experienced. As an RPG, it was weird; its story was charming and surprisingly dark at times. It cemented a place in my heart and remains one of the games I play to remind myself that games are still worth defending as art. It’s not often that a game comes around and shakes me right to the core, affecting me for weeks. I never know how to react to them, and most times I’ll switch between trying to be happy about how great it was, and horribly depressed that I can never experience it the same again. Undertale is one of those games. Undertale tells the story of a young boy (or girl) traveling through a mysterious and strange cavern after having fallen down into it one day. The cavern is inhabited with monsters who used to live among the humans until a war broke out and the humans sealed them behind a magic barrier, trapping them in the cave forever. What follows is a story of love, loss, and friendship as the player tries to make it to barrier to escape from the cave and return home. However, it’s not that simple. The story adapts to player choices and what can be a wonderfully fun story can quickly turn into a nightmarish hell full of anger, hatred, and bloodshed. It’s a fascinating tale, expertly told, and it kept me guessing all the way to the end; even when I thought it seemed obvious what was going to happen, the game shouted “WRONG” right in my face. It was incredible. Along their journey, the player will meet several interesting, funny, and extremely likeable characters. While none of them join your party, they add a lot of colour to the game’s story and leave lasting impressions on the player. Alternatively, the choices you make can affect how each character reacts to you, and what could be a pleasant experience for one player might be a horrible experience for another. 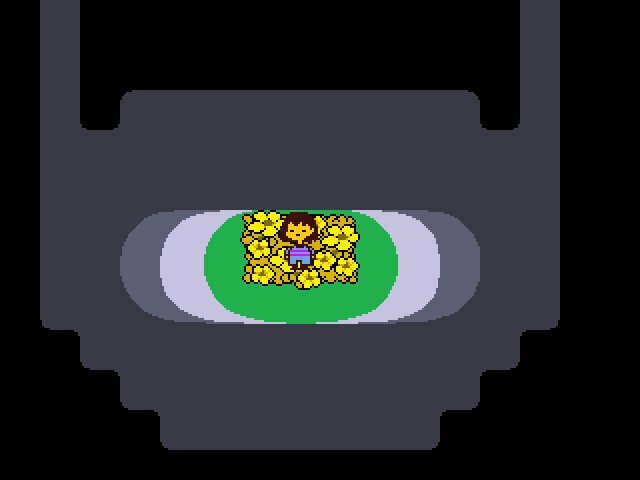 Undertale is an RPG and very reminiscent of the SNES Earthbound. Players traverse a beautiful and kooky world with a few random turn-based battles peppered in for good measure. However, Undertale isn’t like your traditional RPG; while being aesthetically similar to Earthbound’s battles, Undertale puts a very unique spin on the entire thing. When attacking, players can choose to attack traditionally, or find a nonviolent alternative to battles. When the enemy attacks, the game becomes a bullet-hell and players must keep a little heart away from damage. What makes it more difficult is that fighting monsters is the only way to earn EXP. There is a serious undercurrent of morality within the game and its battles and players may find themselves cross when it seems they’re essentially murdering an enemy that has no interest in fighting, or trying to find a way to get out of situations that seem like it’s kill-or-be-killed. It’s incredibly challenging and extremely satisfying, with harder fights creating the perfect level of frustration vs reward. Undertale is also very Meta in its design, making the exploits of Psycho-Mantis look pale in comparison. It honestly seemed like every small thing I did affected the game in some way and the game (and even characters) adapted to this in some way. One particularly noteworthy moment being when a player called me in-game asking if I preferred butterscotch over cinnamon. My answer was obviously butterscotch, but after the conversation had ended, the game unfortunately crashed. When I re-loaded my file before the conversation had taken place, the character again asked me my preference, this time saying “I have a feeling it’s butterscotch isn’t it?” then proceeding to say our meeting was strange, like she’s seen me before, or known me for a long time. Small touches like that add to the overall experience of the story and connect to the player in a deeply profound way. While Undertale takes a very simple 8-bit style, it does a lot with colour and detail while maintaining an aesthetic of simplicity. Like Earthbound, environments are beautifully crafted or often very empty, creating a hollow, vast atmosphere that works well given the cavernous setting. Enemies in battle have a detailed-yet-simplistic “paper doll” look which allows for them to have movement, but for that movement to feel off and unsettling. 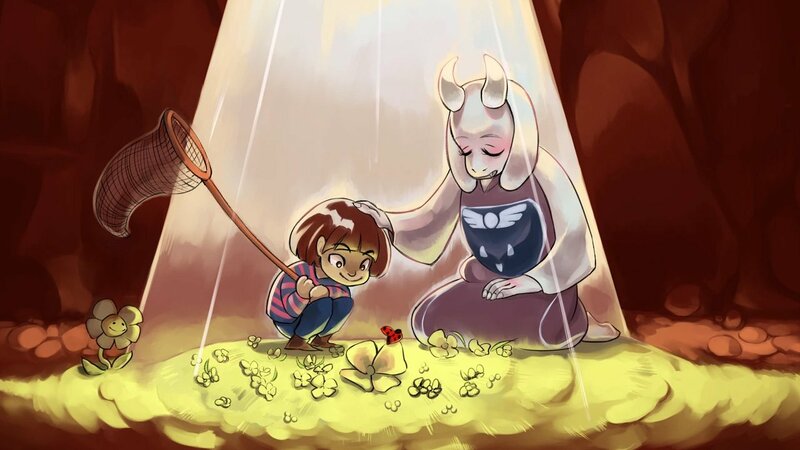 Undertale is like Earthbound if it were a Hayao Miyazaki movie: strange, interesting, and profoundly unique. The ways in which each little choice can affect the game will constantly keep you guessing, and its multiple paths are each truly moving experiences capped off by a “true ending” that actually had me weeping by its sheer force of power. Undertale tells the story of a young boy (or girl) traveling through a mysterious and strange cavern after having fallen down into it one day.